Happy hour is to sushi as, well, happy hour is to booze: It's necessary in these rough economic times. 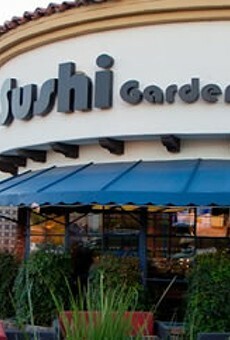 Sushi Garden hosts a happy hour with special prices on select sushi, Japanese food and booze every Monday through Friday from 4 to 7 p.m., and from 10 p.m. to midnight on weekends. All the standard favorites are available at the all-you-can-eat buffet from 11 a.m. to 2 p.m. weekdays, and noon to 3 p.m. weekends; of course, you can order your favorites à la carte any time. The lunch crowds, along with the portions, are a bit overwhelming, so get there early, and get there hungry. Cheers to happy hour!